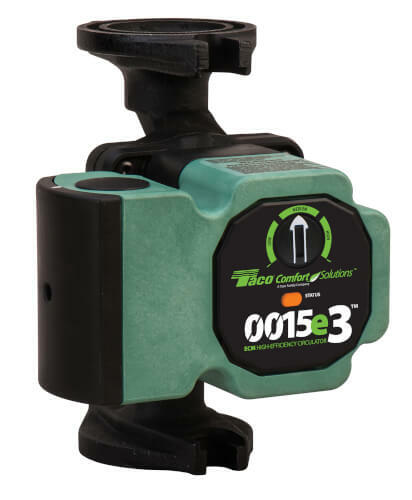 Taco 0015e3™is a variable speed, high-efficiency wet rotor circulator with an ECM permanent magnet motor. It’s ideal for hydronic systems zoned with circulators or zone valves. With 3 easy settings, the 0015e3 delivers performance, reliability and ease of installation that made the 00® famous. 3 easy settings: LOW (5 feet head), MEDIUM (10 feet head), HIGH (18 feet head), 16 gpm max flow. Dual electrical knockouts, 6” stranded wire leads included for easy wiring. Use with a Taco ZVC Zone Valve Control or SR Switching Relay for ON/OFF operation. Optional 2-way flange model reduces SKU’s and provides universal fit-up to any flange position. Double insulated. No ground wire required.